Ghana’s second Karpowership with a 450-megawatt capacity has been berthed at the Tema Fishing Harbour. The Karpowership deal was a make-shift arrangement by the erstwhile government to curtail the harsh implications of the infamous “dumsor” and its effects on businesses and Ghanaian households, as well as augment the country’s current energy supply capacity. 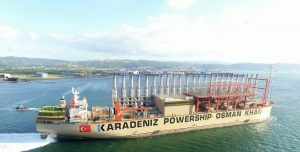 The arrival of Karadeniz Powership Osman Khan is in line with the Power Purchase Agreement signed with the Electricity Company of Ghana (ECG) requiring Karpowership Ghana Company Limited to provide a total of 450MW capacity of power that will directly feed into the national grid for a period of10 years. Director of Tema Port, Edward Osei, said the Karpowership will have a significant contribution to Ghana’s electricity supply as the most reliable power plant in the country and create more employment opportunities.